2 Steps hot and cool pore care. Ingredients: Steam Mask: Glycerin, Kaolin, Cetearyl Alcohol, Sorbitan Olivate, Stearic Acid, Cetearyl Olivate, Charcoal Powder, Arginine, Carbomer, Betaine, Prunus Mume Fruit Extract, Vanillyl Butyl Ether, Prunus Armeniaca (Apricot) Seed Powder, Sorbitan Stearate, Dimethicone, Water, Juglans Regia (Walnut) Shell Powder, Dipotassium Glycyrrhizate, Butylene Glycol, Portulaca Oleracea Extract, Glycyrrhiza Glabra (Licorice) Root Extract. 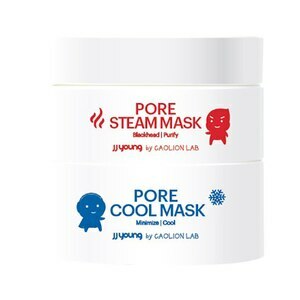 Cool Mask: Water, Glycerin, Kaolin, Bentonite, Caprylic/Capric Triglyceride, Glyceryl Stearate, Cetearyl Olivate, Sorbitan Olivate, Cetyl Ethylhexanoate, Isoamyl Laurate, Vitis Vinifera (Grape) Seed Oil, Charcoal Powder, Limonia Acidissima Extract, Lonicera Caprifolium (Honeysuckle) Extract, 1, 2-Hexanediol, Volcanic Ash, Illicium Verum (Anise) Fruit Extract, Menthol, Methyl Diisopropyl Propionamide, Panthenol, Xanthan Gum, Scutellaria Baicalensis Root Extract, Butylene Glycol, Sodium Hyaluronate. JJ Young pore steam mask: Step 1. Hot pore cleansing: Apply enough amount (3g) evenly to face. Massage gently for 1 to 2 minutes. Leave on for 5 to 10 minutes. Rinse clean with cold water. For use on the entire face or targeted areas. Contains natural buffing grains. Avoid contact with eye area. JJ Young pore cool mask: Step 2. Cool pore minimizing: Apply enough amount (3g) evenly to face. Leave on for 10 to 15 minutes. Rinse clean with lukewarm water. For use on entire face or targeted areas. Precautions: In case skin reddens, swells or itches after use or contact with direct sunlight, discontinue use and contact a physician. Do not use on wounds, swollen areas or rashes. Usage and maintenance of products: Keep out of reach of children; keep out of direct sunlight. Avoid eye area. Be careful of product's natural buffing grains. Close eyes when rinsing to avoid contact with eyes. If grains come in contact with eyes, wash eyes immediately with water. Contact a physician if needed.